A former teacher, Sherrill S. Cannon of Great Bend, Pennsylvania, is now retired and travels the country with her husband in an RV, going from coast to coast to visit their children and grandchildren, sharing her books along the way. Author Sherrill S. Cannon’s children’s books have won her seventeen prestigious awards in 2011-13. In the past four years, this award-winning former teacher has had five books and six children’s plays published. Her bestselling rhyming books include Gimme-Jimmy, The Magic Word, Peter and the Whimper-Whineys, and Santa's Birthday Gift. Manner-Man is her newest release, and her next book is under contract for 2014. It is not Super-Man, it is Manner-Man! 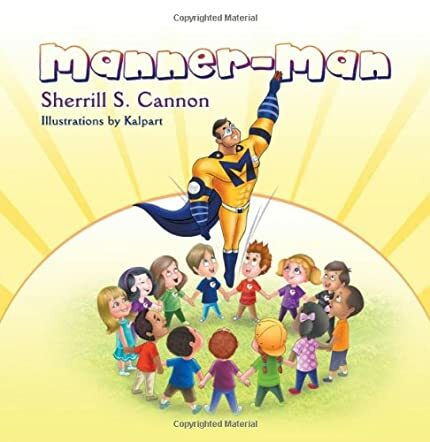 I thoroughly enjoyed Sherrill Cannon’s new children’s book “Manner-Man.” Ms. Cannon has a unique ability to teach children very valuable behavioral lessons through her awesome writing. And the rhyming style of writing makes the story fun and enjoyable and easy to read. And the neat thing about Ms. Cannon’s books is that they are not only fun for children, they are just as much fun for adults. And if "Manner-Man" says something, we are supposed to listen to it, right? My new hero Manner-Man’s big and he’s strong. He helps to teach children what’s right and what’s wrong. For sometimes that hurts worse each time it occurs. Will hurt your friends’ feelings, I think you will find. And the cool thing is, this book is packed full of lines just like this. And teaching many issues that are so important to build into the character of our children, this author makes it so easy and exciting. And you will find that the awesome and unique illustrations created by Kalpart bring the pages of this book to life. The pictures just fit the story so very well. This is a book I highly recommend for all parents and guardians, and any library that holds children’s books. You cannot go wrong with “Manner-Man”. Another great story with a powerful message for your children about bullying by Sherrill Cannon. We loved it! I've been trying to find some books with super heroes for my son. Thanks! This sounds like yet another great book from Sherrill! I love that she focuses on manners. I am forever saying "Not nice!" to my 2 year old!